Copy the agent setup file to a location accessible from the machine where you want to install the management agent. Log on to the machine as an Administrator. Double-click the agent setup file to launch the Veeam Availability Console Communication Agent wizard. Follow steps of the wizard. At the last step of the wizard, click Install. When installation completes, click Finish to close the wizard. The agent will be installed by the following path: %ProgramFiles%\Veeam\Availability Console\CommunicationAgent. In the icon tray, right-click the management agent icon and choose Agent Settings. If the icon is hidden, display hidden icons, find Veeam.MBP.Agent.Configurator in the list of notification area icons, and choose to show the icon and notifications for it. In the Management Agent Settings window, specify settings that the agent must use to connect to Veeam Availability Console. In the Cloud Gateway field, type FQDN or IP address of a cloud gateway. In the Port field, specify the port on the cloud gateway that is used to transfer data to Veeam Availability Console. In the Username and Password fields, type user credentials of a Company Owner. The user name must be provided in the <Company Name\User> format. In the Management Agent Settings window, click Apply. 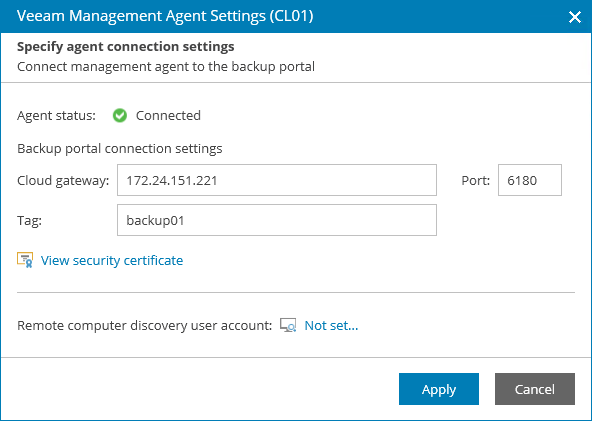 Management agent will connect to Veeam Availability Console server, download the security certificate and perform its verification. To view error details, at the top of the window, click the Learn more link. To ignore the error and continue agent configuration, click Save. In the Management Agent window, click Restart to restart the management agent and apply connection settings. Wait for the agent to connect to Veeam Availability Console. When the agent connects to Veeam Availability Console, the status in the Veeam Master Agent Settings window will be displayed as Connected. The agent icon in the icon tray will turn blue. In theManagement Agent Settings window, click Close.